Season Six of FX's It's Always Sunny in Philadelphia finds the dim-witted gang from Paddy's Irish Pub up to their typical absurd shenanigans. For those that aren't familiar with the series, Dennis (Glenn Howerton), Mac (Rob McElhenney), and Charlie (Charlie Day) are friends from school and co-owners of Paddy's. Dennis and Mac are also roommates. Dee (Kaitlin Olson) is Dennis' twin sister and works at the bar. Frank (Danny DeVito) is the adoptive father of Dennis and Deandra and possibly the biological father of his roommate, Charlie. They are crude, dumb people who frequently make the wrong choice, which leads to funny results for viewers. Their lives get thrown into turmoil pretty quickly when "Mac Fights Gay Marriage," after discovering former flame Carmen the Transsexual (Brittany Daniel) has had her reassignment surgery and is about to get married. Charlie and Frank consider gay marriage for themselves in order to score some benefits. Dennis and Dee decide to reunite with high school crushes Maureen and Bill Ponderosa. Bill is overweight and married so Dee flees the scene, but Dennis and Maureen end up married, causing Mac to get kicked out of the apartment. Aside from running the bar, the gang takes on some extracurricular activities over the course of the 12 episodes. They buy a boat; Frank, Dennis; and Dee start a podcast; Mac and Charlie work on cleaning up a neighborhood pool and consider having their mothers live together. At her former high school, Dee gets a job as a substitute drama teacher and Charlie becomes the janitor. Mac and Dennis trick Dee and show her students their film "Lethal Weapon 5, in what was my favorite segment of the season. But the biggest moment in any of their lives is Dee getting pregnant. The guys freak out when she says it was one of them that did it at the Halloween party. They try to recall "Who Got Dee Pregnant?" and a number of people tell differing stories, reminiscent of Kurosawa's Rashomon. This season they were joined by Jason Sudeikis as former friend Smitty, Rene Auberjonois as Dee's former drama teacher, Dave Foley as the school principal, Tom Sizemore as a trucker, and playing themselves Philadelphia Phillies Ryan Howard and Chase Utley. Season Six is the first shot in high definition, making very good use of the 1080p/MPEG-4 AVC encoded transfer, which was displayed at an aspect ratio of 1.78:1. It's much improved from the previous season release though the show is limited by the source's cinematography. There are bright, strong colors. Objects exhibit good depth and details throughout. The DTS-HD Master Audio 5.1 is adequate for what the source delivers. Dialogue is usually clear and understandable, even when Charlie reaches his highest pitch. Not much else happens on the soundtrack other than when Lethal Weapon 5 is on. The surrounds deliver the music with good fidelity and offer rare ambiance that doesn't enhance the scenes much. The Blu-ray offers the Season Mode option that “allows you to watch every episode from this season without interruption and will remember your place if you need to leave." The set is filled with Special Features. There are four commentaries by Rob, Glenn, and Charlie and they appear on "The Gang Buys a Boat," "Who Got Dee Pregnant?" "Charlie Kelly: King of Rats," and "The Gang Gets Stranded in the Woods." Legal Advice with Jack Kelly (HD, 3 min) is a funny bit with Charlie's uncle on his own public access show. Dennis and Dee's Podcasts (1080i,13 min) cover the border patrol, serial killers, and terrorists. They are come across like the first pass at improving these bits, making them authentic but not that funny. There are six combined Deleted and Extended Scenes (HD, 15 min), a Blooper Reel (HD, 7 min), Lethal Weapon 5 Extended Cut (HD, 15 min) with Optional Commentary by Mac, Dennis, and Charlie. Also, include is the Wilfred Pilot Episode (HD, 23 min). The Blu-ray has an exclusive. "The Sunny Flip Cup Trivia Challenge" offers trivia and games played with the remote related to the season, such as Don't Wake Maureen, Sweet Dee's Dance Off, Charlie's Slap Shot, and Frank & Charlie's Bitchin' Sewerboat Treasure Hunt! 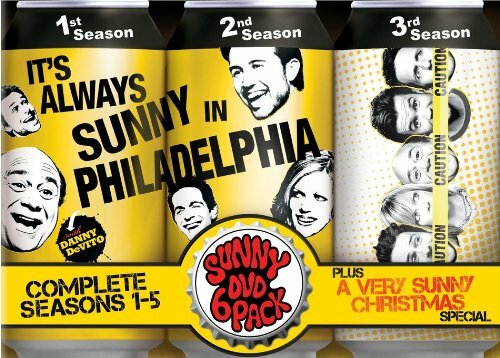 Season Six of It's Always Sunny in Philadelphia is a nice bit of madness to have on the shelf when you need a crude laugh and the upgrade to high definition is pleasing. And don't let the late season put you off. It only takes an episode or two to get informed on all you need to know. See you at Paddy's. Sounds like a great set for new and returning Sunny fans, El B.